Describes a shape with four- or more-sides with many straight edges. 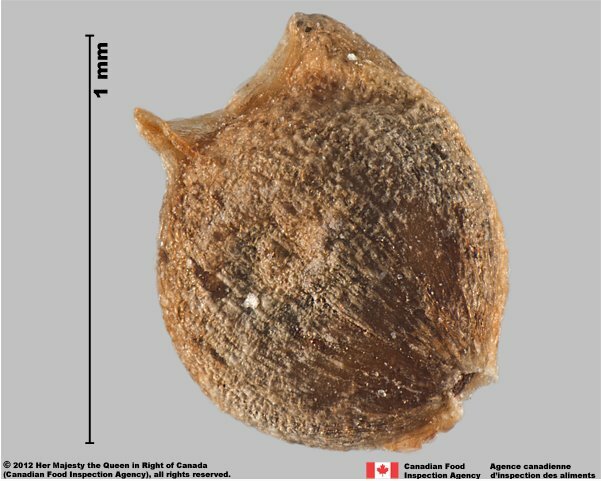 A plant that completes its lifecycle, meaning its seed germinates producing a plant that flowers, bears fruit, and then dies, in one growing season. A slender bristle, often twisted and bent like an elbow, attached to glumes or lemmas in grasses (Poaceae). 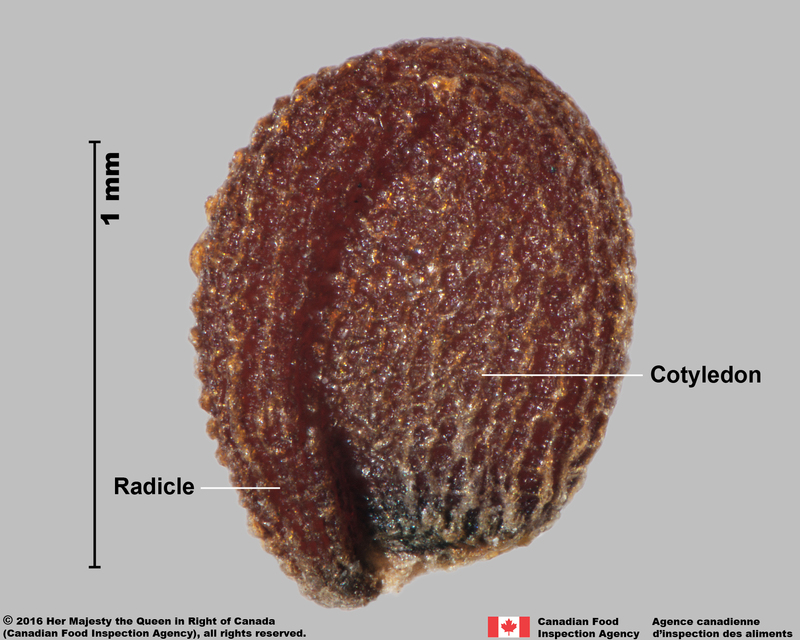 A fleshy fruit containing a few to many seeds. A plant that completes its life cycle within two growing seasons. 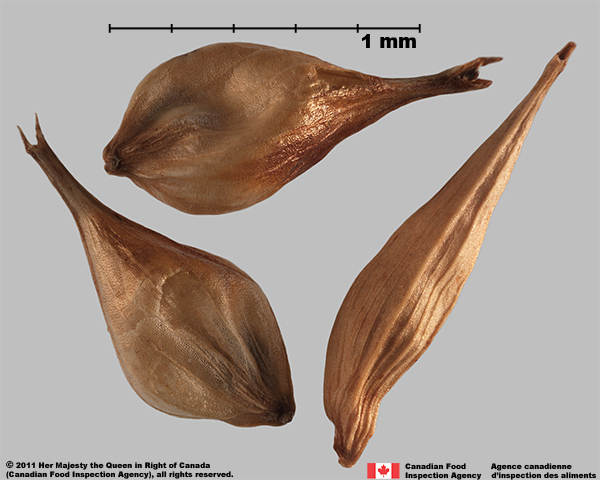 In the first season the seed germinates producing a plant that usually exists as a basal rosette throughout the winter (eg. Carduus nutans). 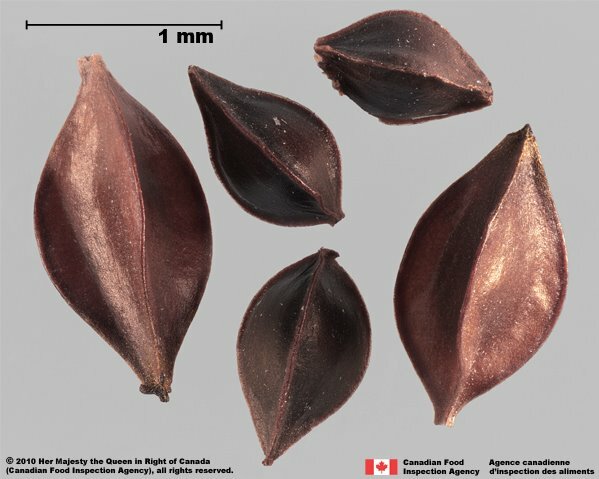 The following growing season the rosette bolts, flowers, produces seeds, and then dies. 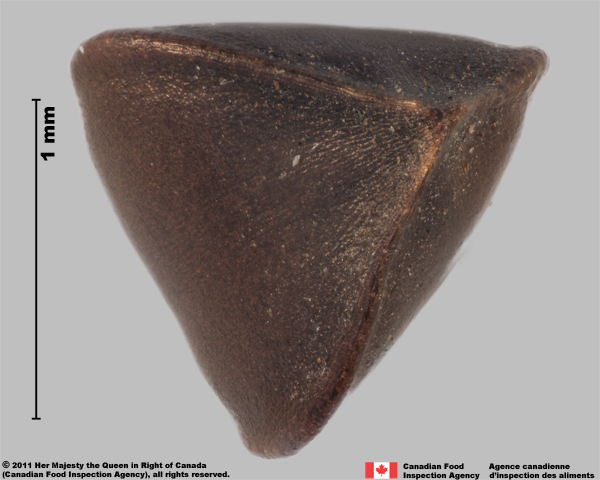 Describes a four- or more-sided shape with straight edges. 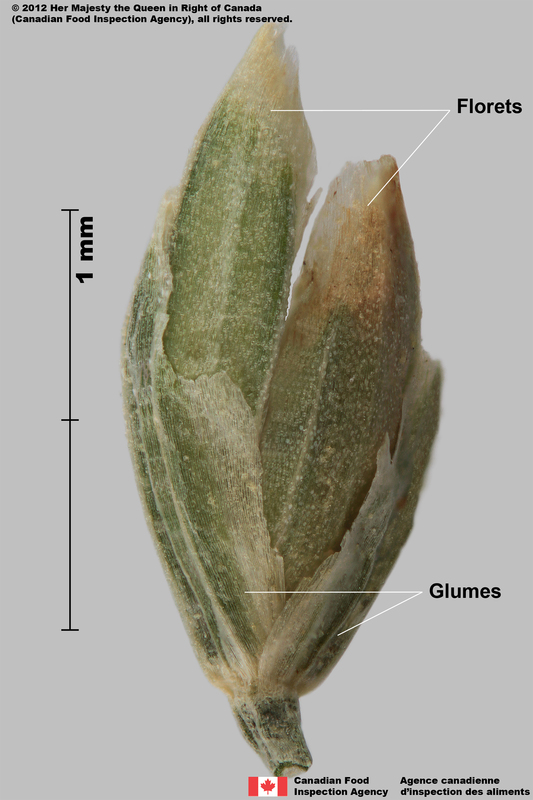 Leaf-like or scale-like structure often associated with flowers. 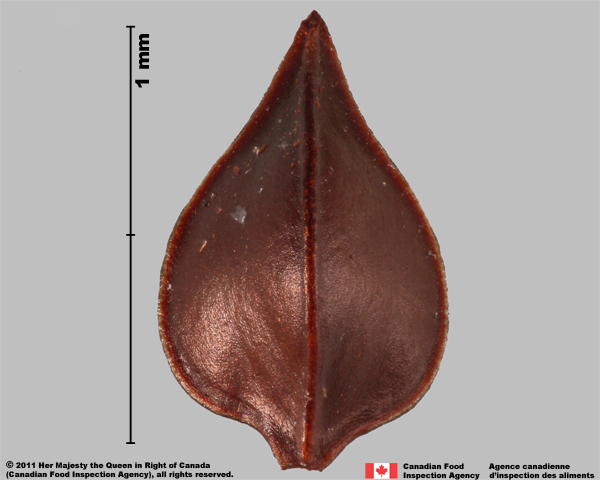 A small bulb formed from modified leaves, often held within the inflorescence. A form of vegetative reproduction. 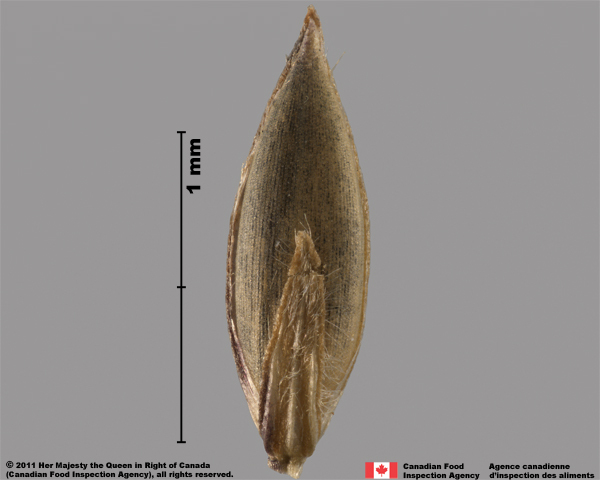 Bracts or excrescences of the stem forming a generally spinous envelope around a seed or spikelet. 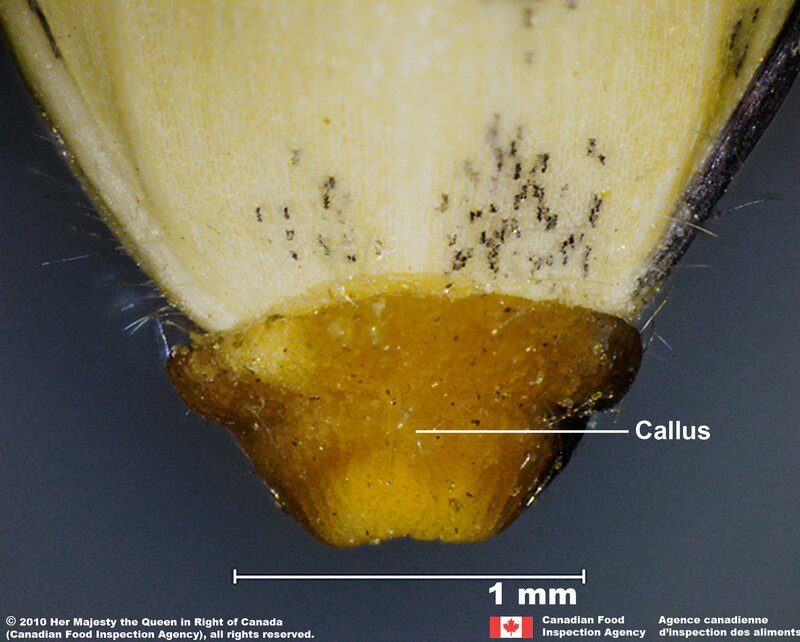 A thickened area at the base of the floret in some grasses (Poaceae), with a distinctive scar or hairs. 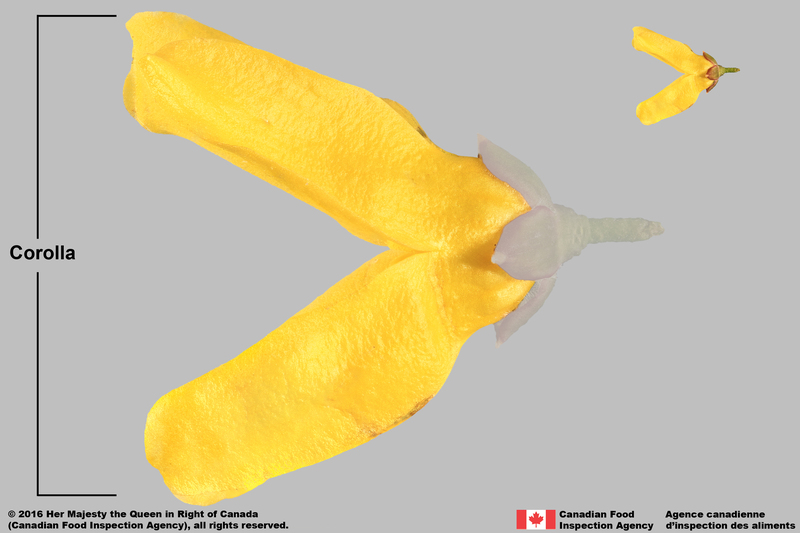 Collective term for the sepals: the whorl of bracts on the outside of the flower that is usually green. 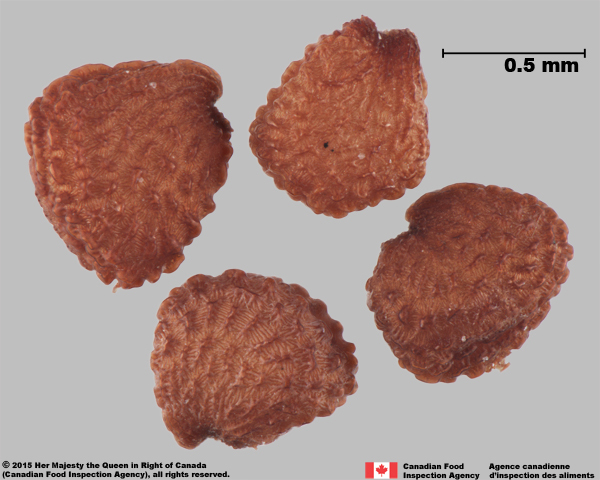 A dry fruit that splits on maturity and releases few to many seeds via slits, pores, teeth, or lids. 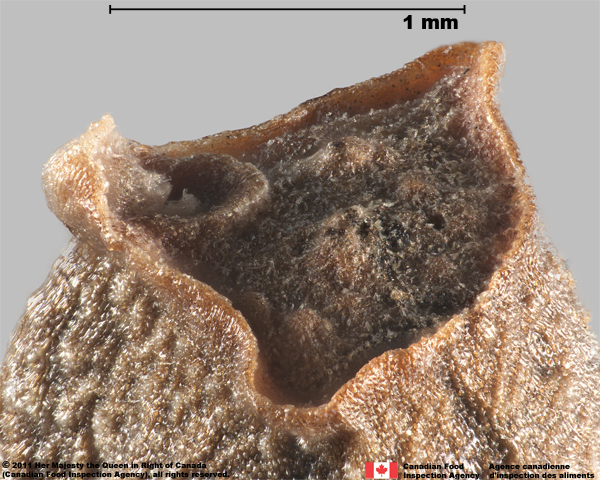 An outgrowth of tissue near the hilum; aids in dispersal by insect vectors. An identification feature in the Spurge family (Euphorbiaceae). 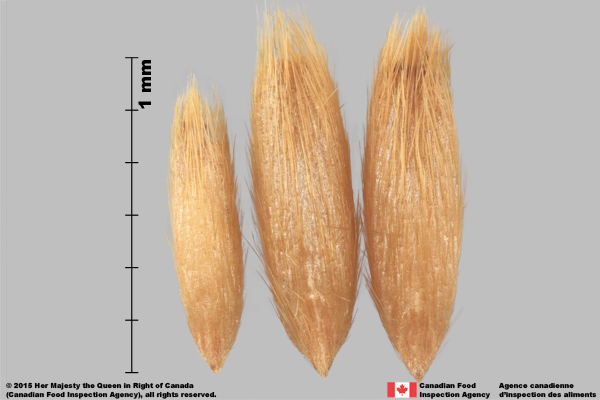 Is a dry fruit of the Grass family (Poaceae), containing one seed that is fused to a thin seed coat, also called the grain. A collective term for the whorl of petals that can be separate or fused in a flower. 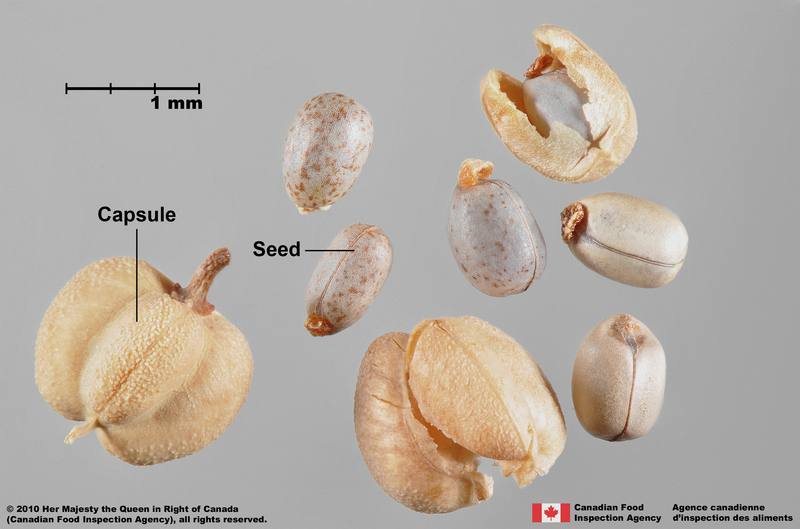 The seed leaves, may be large and lend shape to the seed, such as in the Pea (Fabaceae) and Mustard (Brassicaceae) families. Having unisexual flowers on separate staminate ("male") and pistillate ("female") plants. 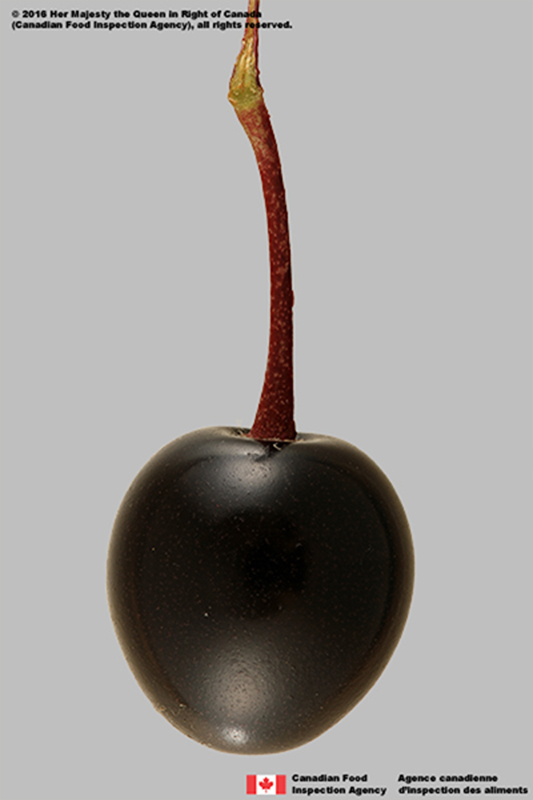 A fleshy fruit with a single hard stone containing a seed, such as a cherry. 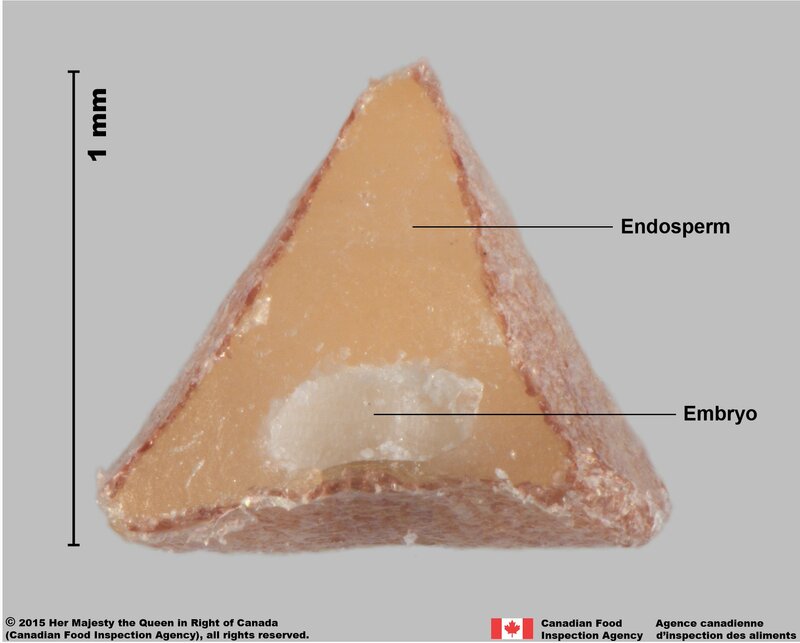 Tissue containing starch and oil that surrounds the embryo and provides nutrients for its development. 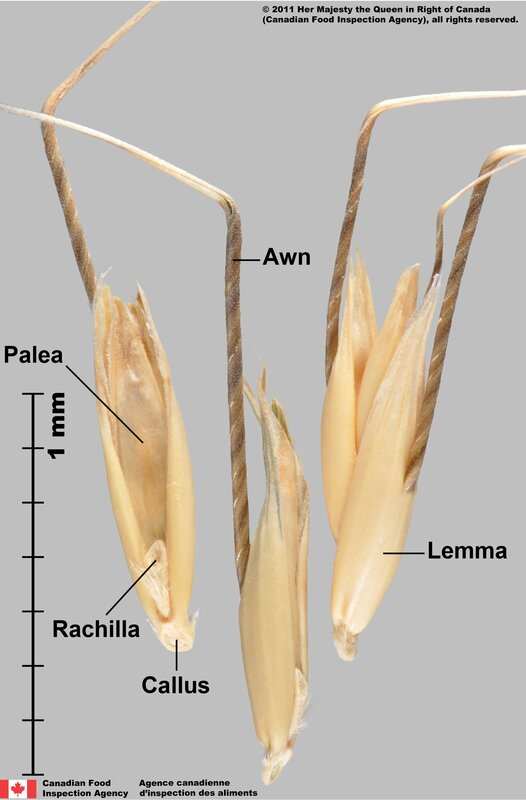 Collective term for the grain or caryopsis enclosed by two bracts known as a lemma and a palea in the Grass family (Poaceae). 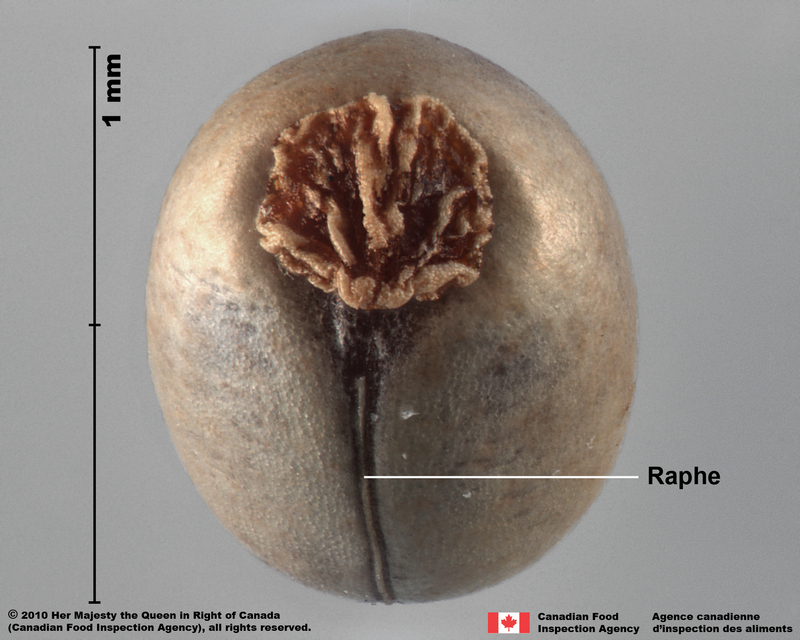 The mature ovary of a flower that encloses the seeds. 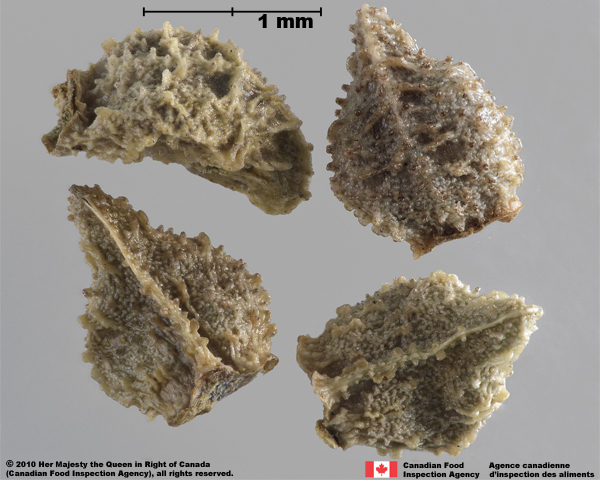 May include accessory parts such as bracts or the perianth. 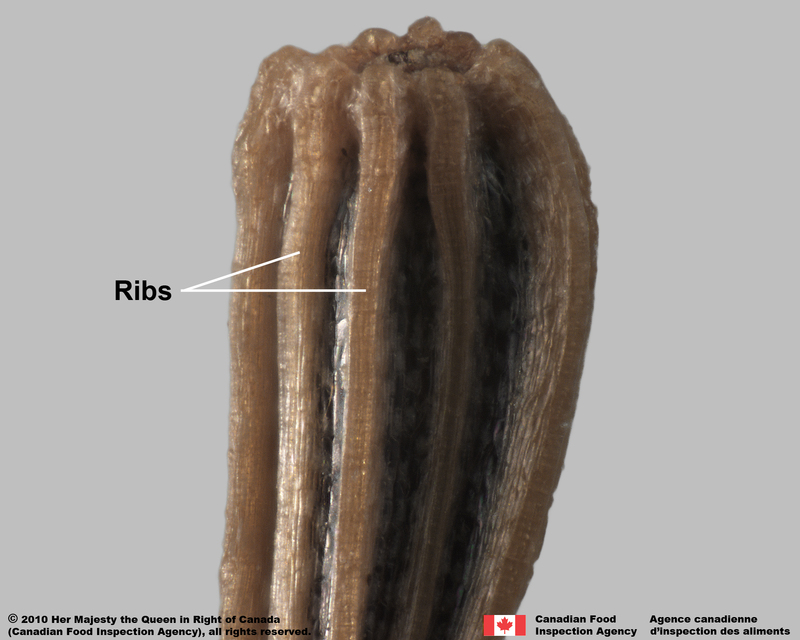 The stalk that connects the developing seed to the fruit wall. 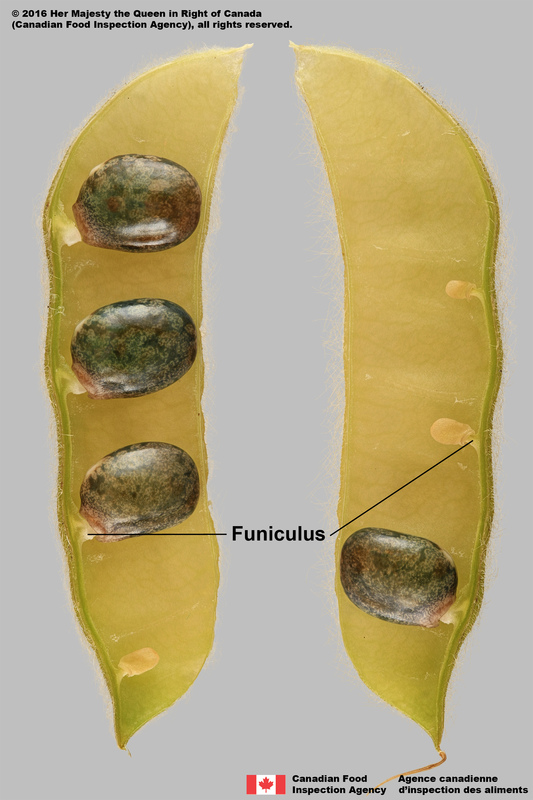 A linear depression; usually a demarcation between the cotyledons and the radicle in seeds of the Pea (Fabaceae) and Mustard (Brassicaceae) families. A pair of bracts enclosing one or more grass (Poaceae) florets. 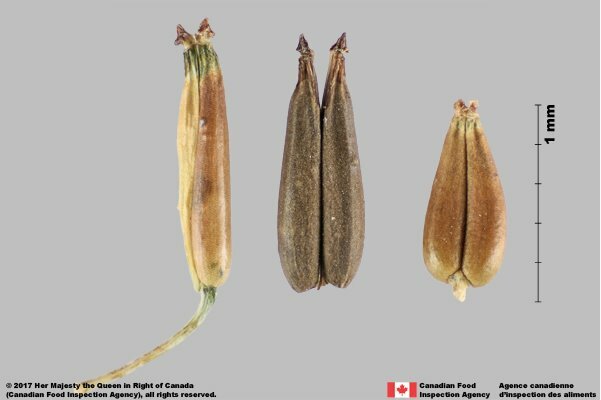 Is a dry fruit of the Grass family (Poaceae), containing one seed that is fused to a thin seed coat, also called the caryopsis. 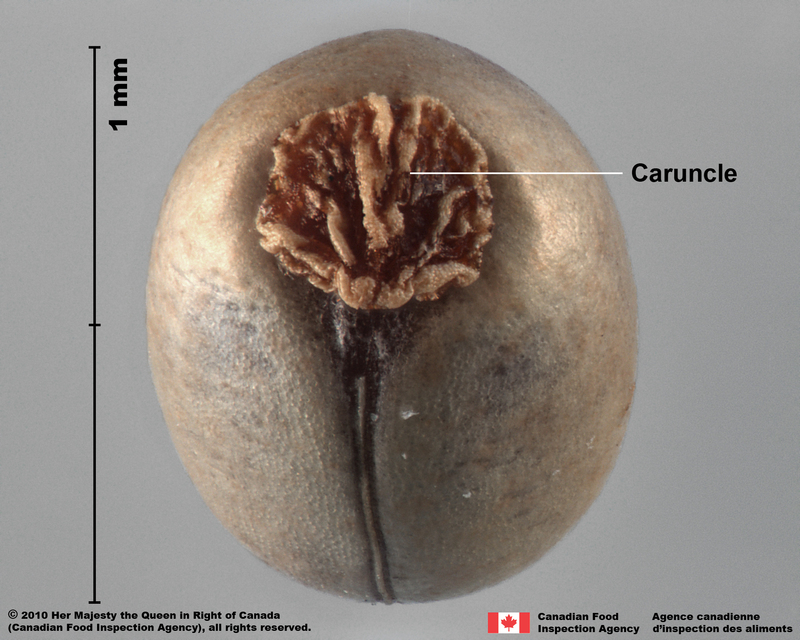 The scar on a seed where it was attached to the ovary during development. 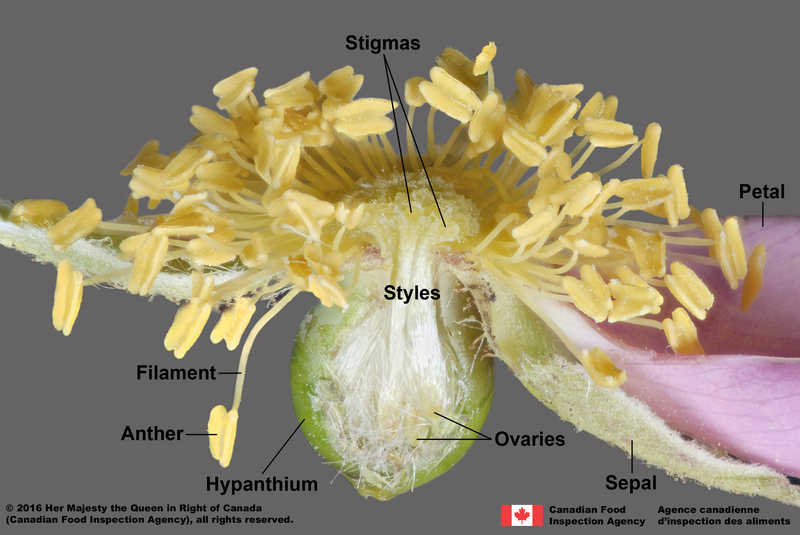 A partial fusion of the sepals, petals and stamens that form a cup-like or tubular structure on the ovary. Also known as a floral cup. 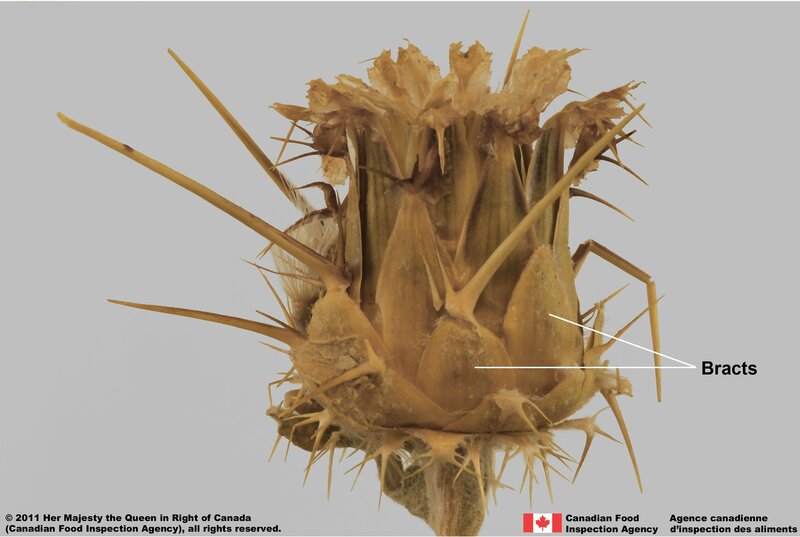 The collective term for the flowering parts of a plant and the stalk that supports them. A prominent ridge, often formed from folding of the lemma in the Grass family (Poaceae) and/or placement of a central nerve. A shape with curved margins that is much longer than it is wide, is widest at the base and then tapers to a pointed apex. 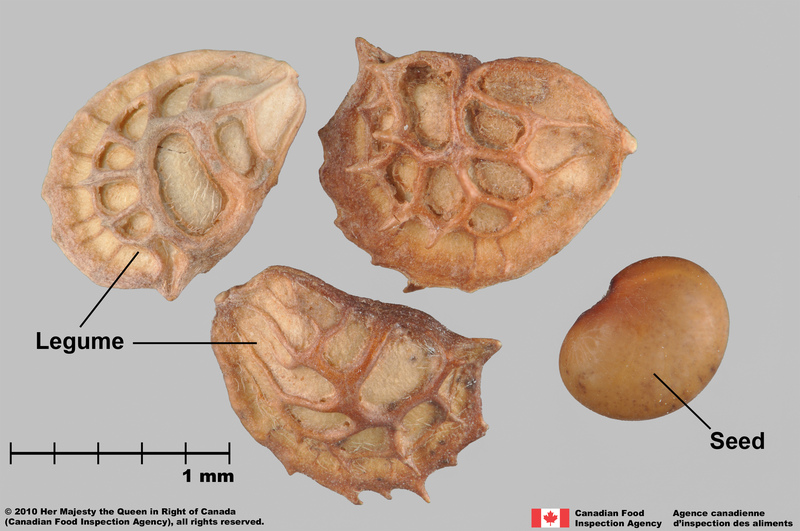 A dry fruit type of the Pea family (Fabaceae) that opens along two longitudinal sutures. In grass species (Poaceae), it is the larger of the two bracts that enclose the flower, and often decorated with hairs and an awn. A narrow shape with straight sides that are long and almost parallel to each other. 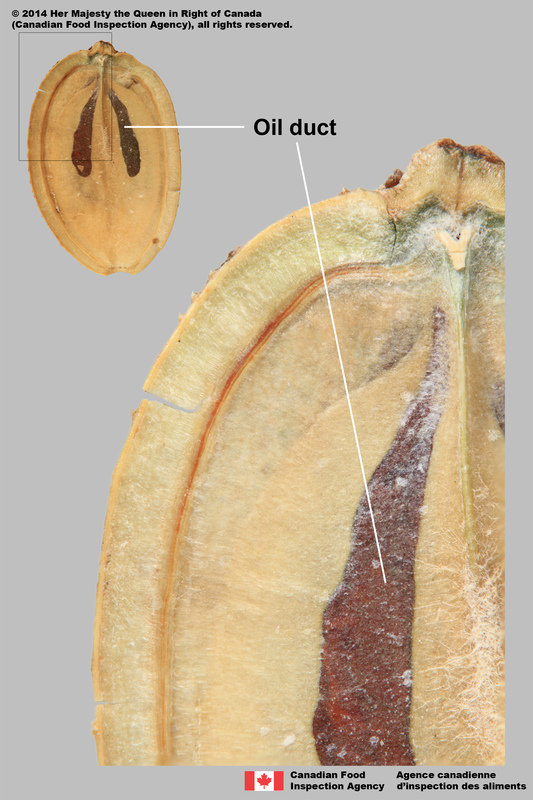 A section of a dry fruit enclosing a seed that breaks away from the schizocarpic fruit at maturity. Seen in the Parsley (Apiaceae) family. 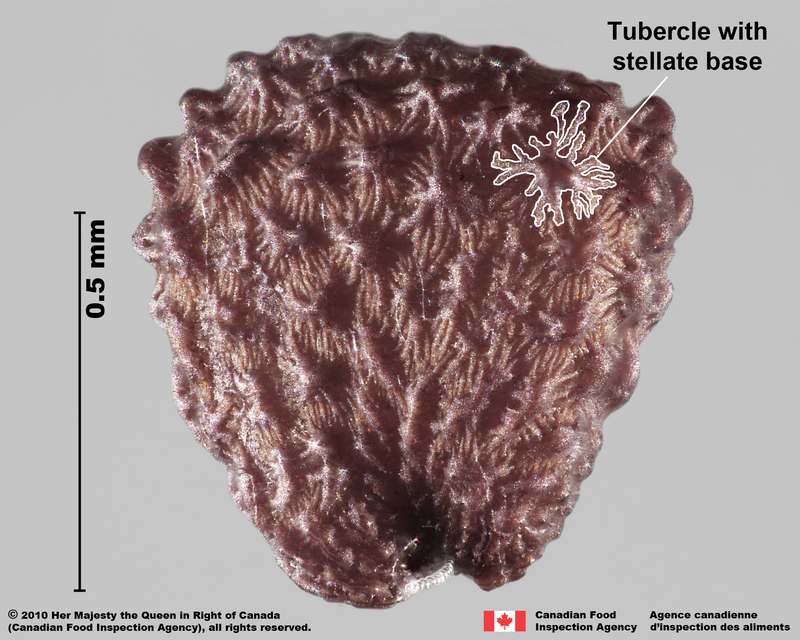 A feature that can be fully seen with the aid of magnification. Having unisexual flowers, i.e. 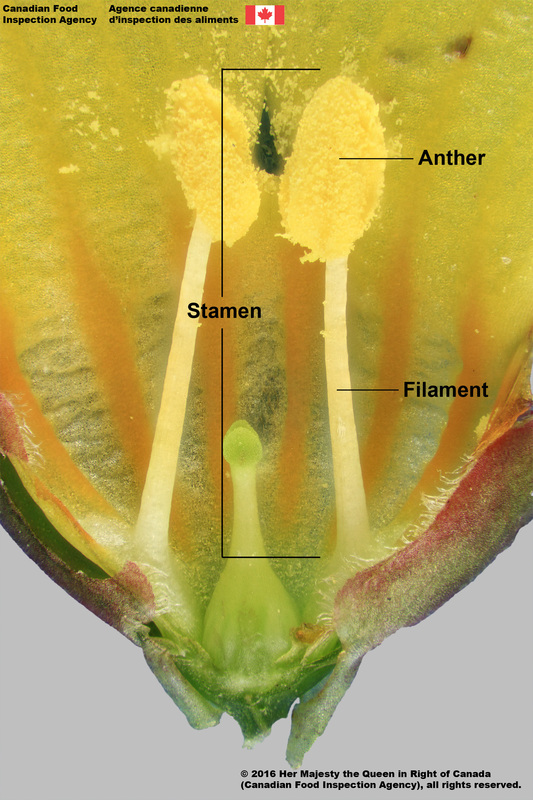 staminate ("male") and pistillate ("female") flowers on the same plant. Also refers to the common status of bisexual flowers on the same plant. In the Grass family (Poaceae), refers to thin, longitudinal lines or ridges commonly seen on the lemma. 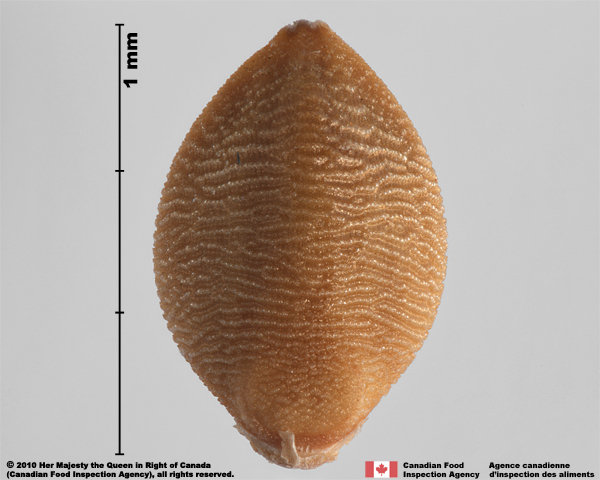 One-seeded dry fruit with a hard, dense shell. Describes a shape with straight margins, widest near the middle, with rounded, pointed or truncate ends. 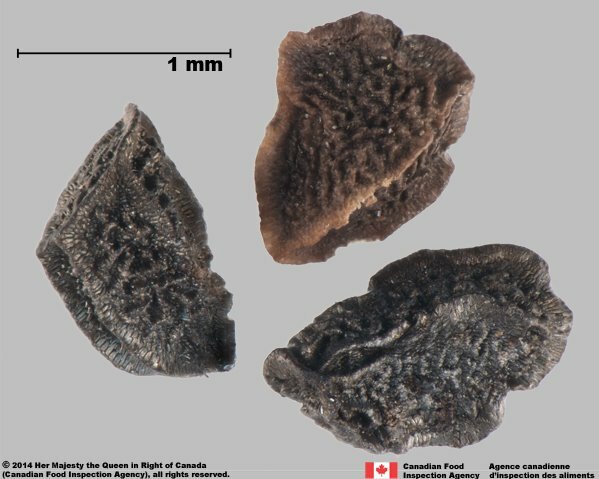 An area of the fruit that contains aromatic oils; used for identification in the Parsley family (Apiaceae). Not allowing light to pass through; solid. 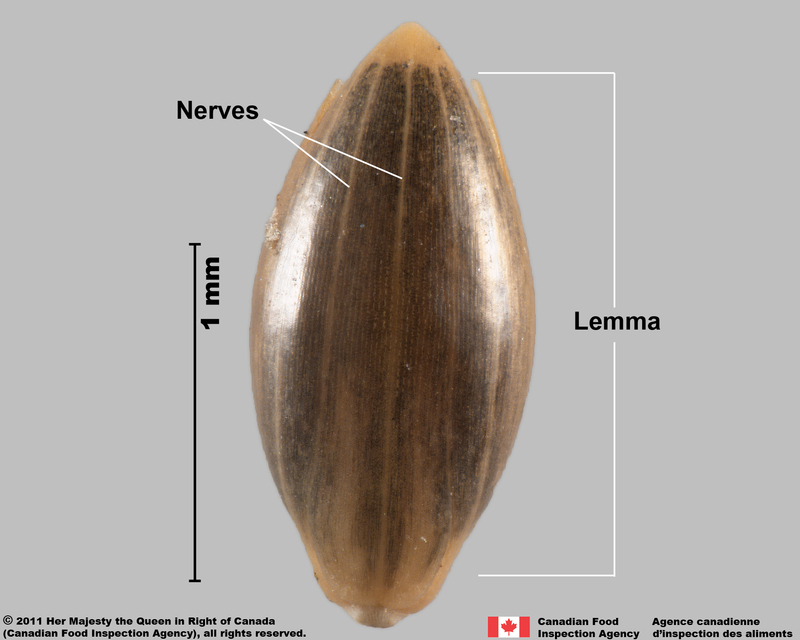 Describes a shape that is widest in the middle and tapered at each end; may be rounded or pointed. 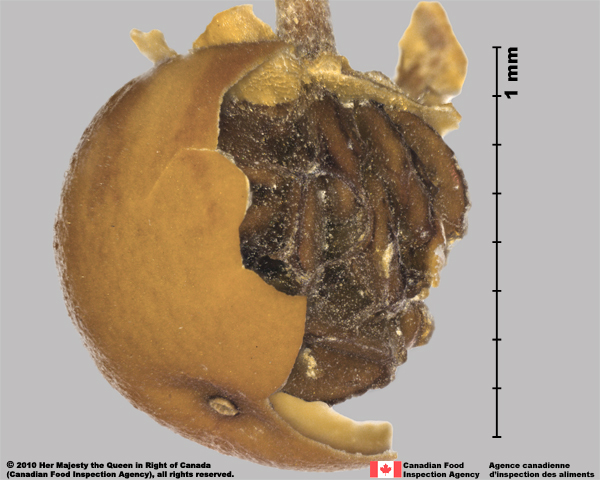 The basal part of the pistil enclosing the ovules (immature seeds) and becomes the fruit at maturity. 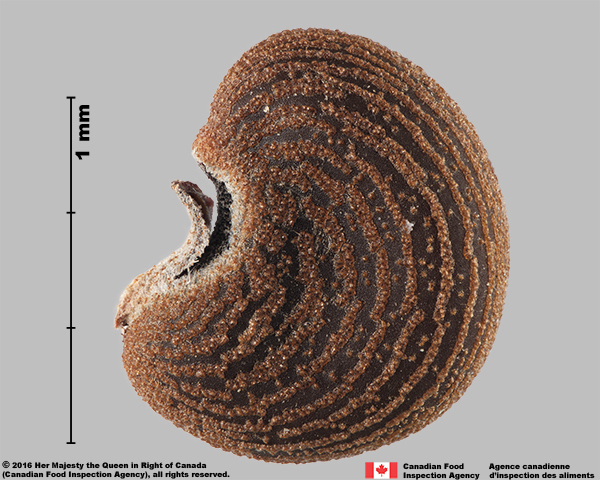 Describes a shape having curved margins and the widest part near the base; egg-shaped. 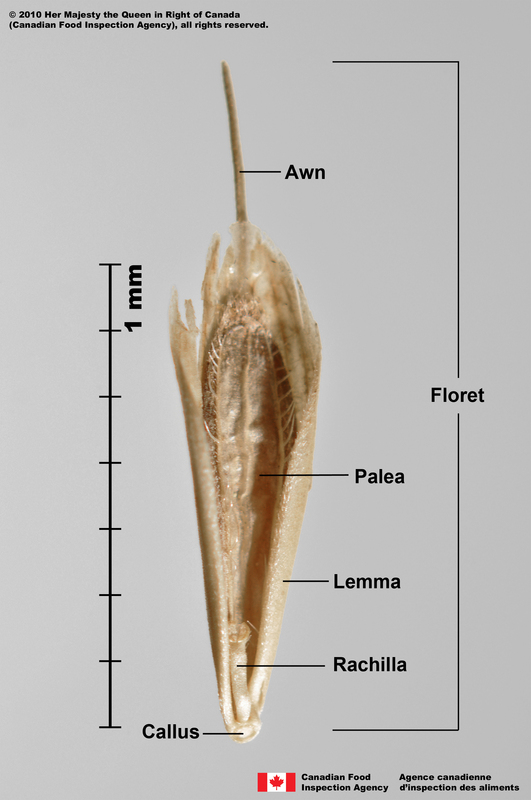 In grass species (Poaceae), it is the smaller of the two bracts that enclose the flower. 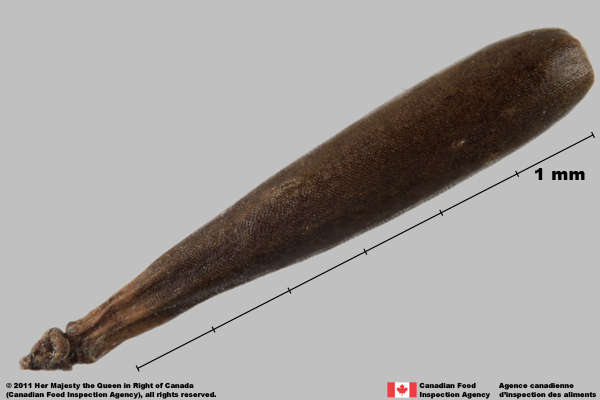 The hairs or teeth around the margin are used for identification. 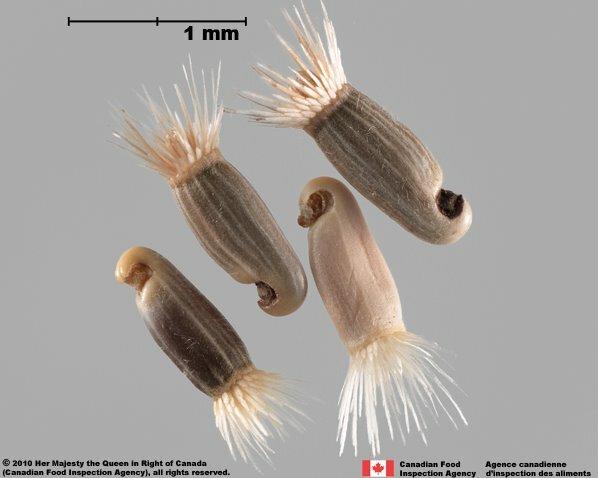 A tuft of bristles, hairs or scales attached to the top of fruits in the Aster family (Asteraceae) to aid in dispersal. 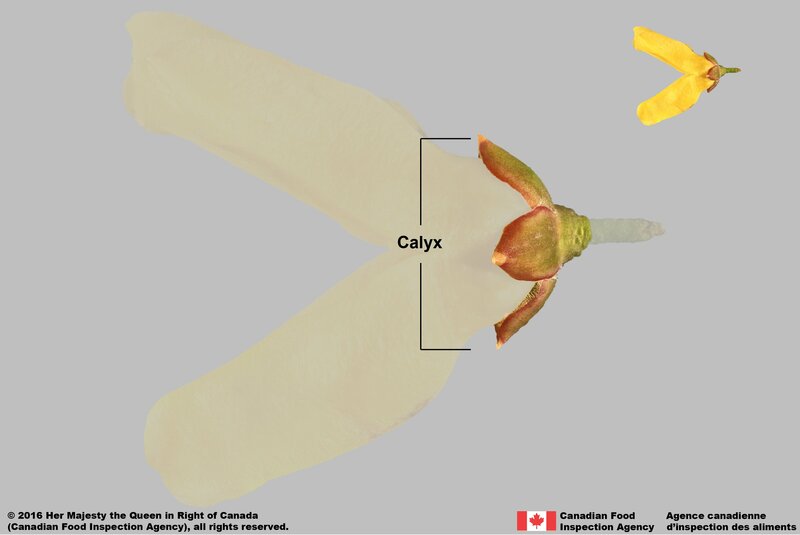 A modified calyx. A plant that renews its growth each year and completes its life cycle in more than 2 years. Flowering and fruit production usually occurs each growing season. 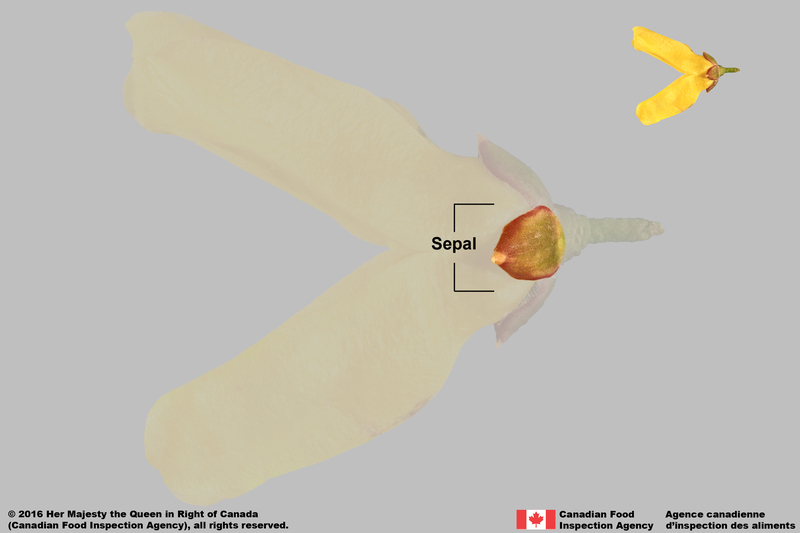 The collective term for the corolla (petals) and calyx (sepals), or tepals. May be persistent and enclose the mature fruit. 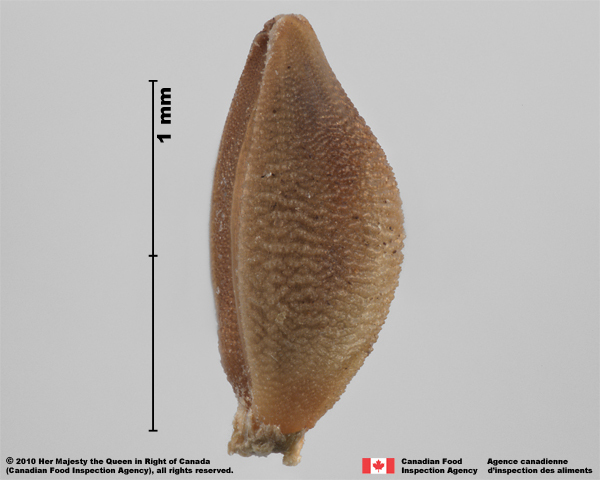 A sac-like, inflated bract enclosing the achene in Sedge species (Carex spp., Cyperaceae). Thin, coloured and showy bracts of a flower to attract pollinators. Collectively termed the corolla. 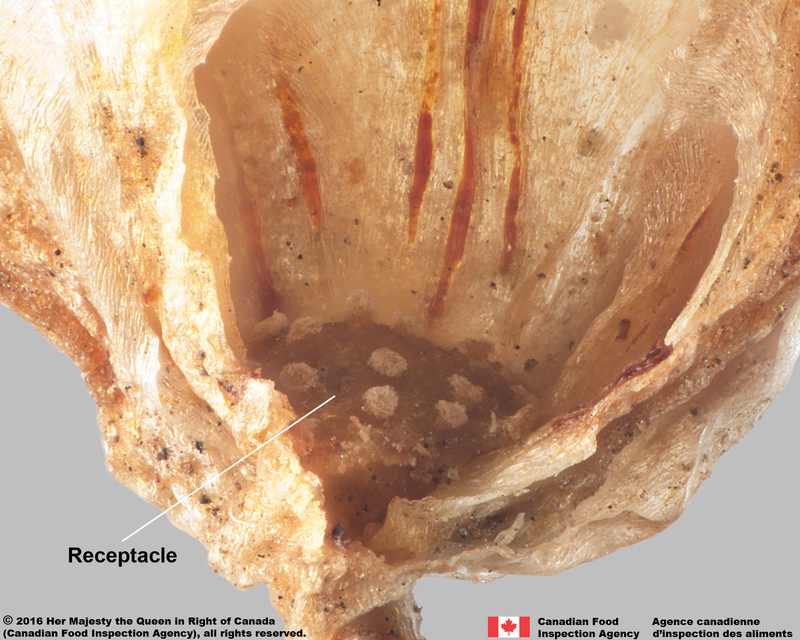 A reproductive organ in a flower that contains the developing seed(s); composed of an ovary, style(s), and stigma(s). Describes a two-sided shape with one side curved and the other flat; most florets of the Grass family (Poaceae). The seed root; it may be distinct and lend shape to the seed, such as in the Mustard family (Brassicaceae). 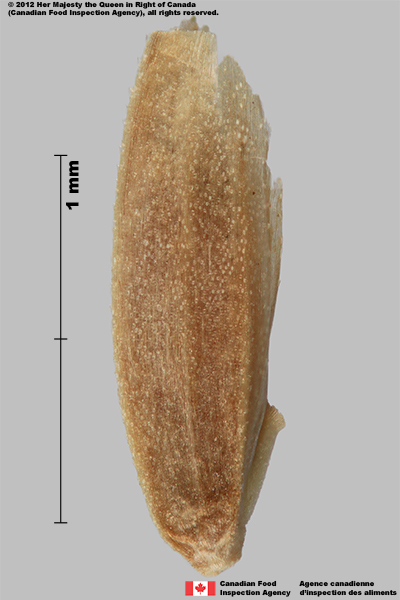 A distinctive darkened and/or raised line on the surface of a seed; a portion of the funiculus that is fused to the seed wall. Seen primarily in the Spurge (Euphorbiaceae) and Loosestrife (Lythraceae) families. 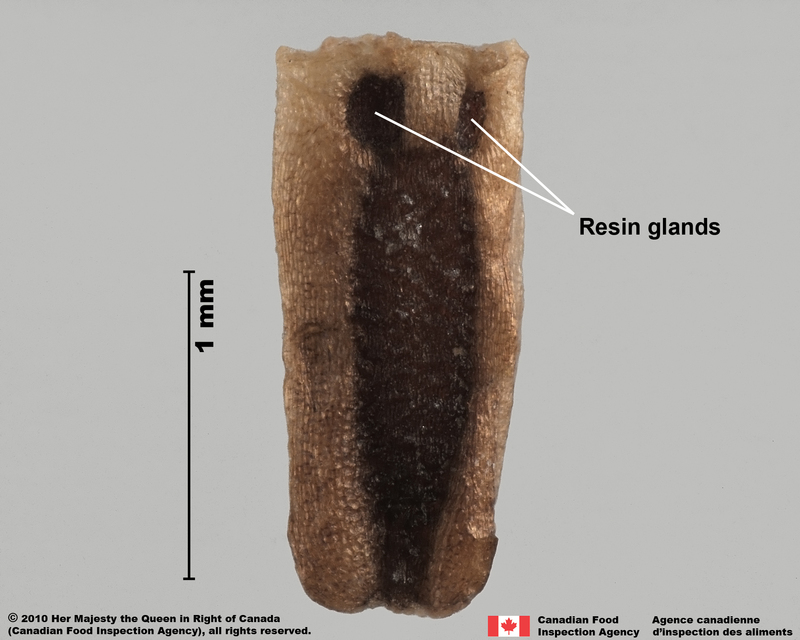 The tissue at the end of the flower stalk to which most or all floral parts are attached. In the Aster family (Asteraceae) individual flowers (florets) are attached to it. 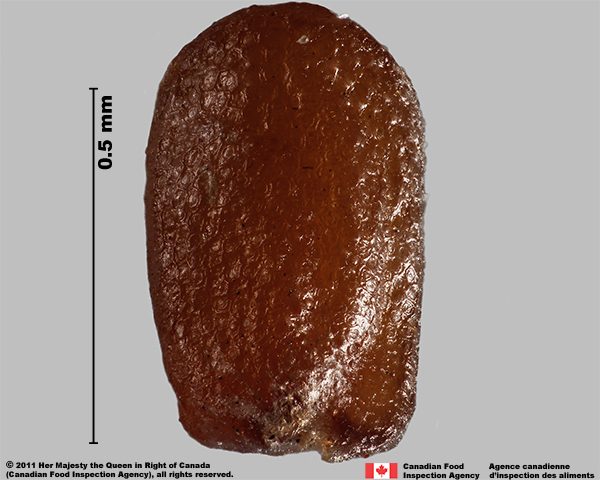 An area of a fruit that contains resin, can be a distinctive marking in members of the Aster family (Asteraceae). 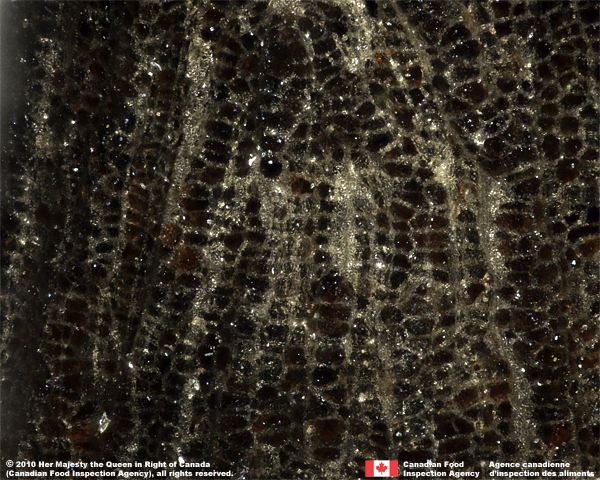 Veins, nerves or ridges on the surface of a seed forming a network or grid pattern. 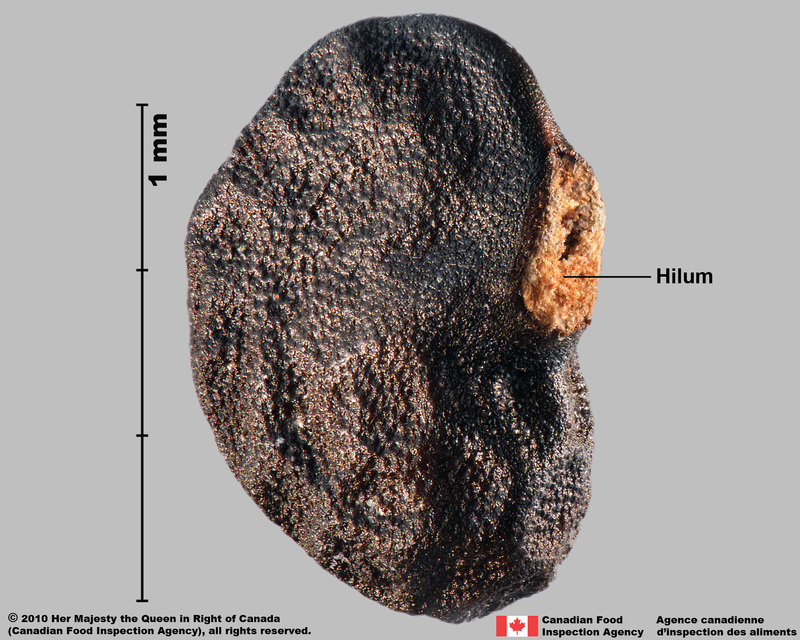 In a fruit, few to several linear, parallel ridges. Seen most often in the Parsley (Apiaceae) and Aster (Asteraceae) families. 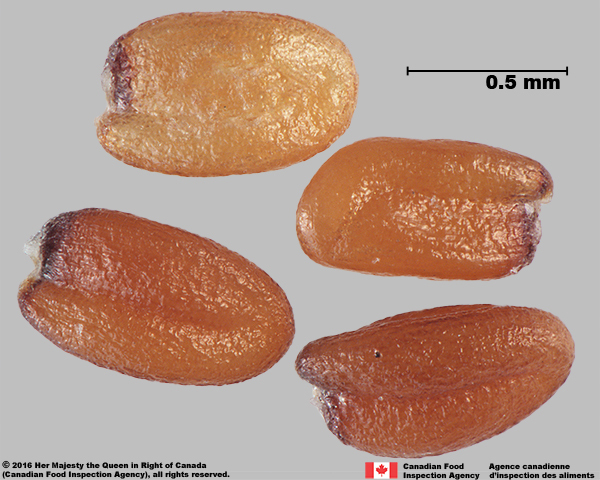 A dry fruit that splits into two or more segments (mericarps), each containing one seed. 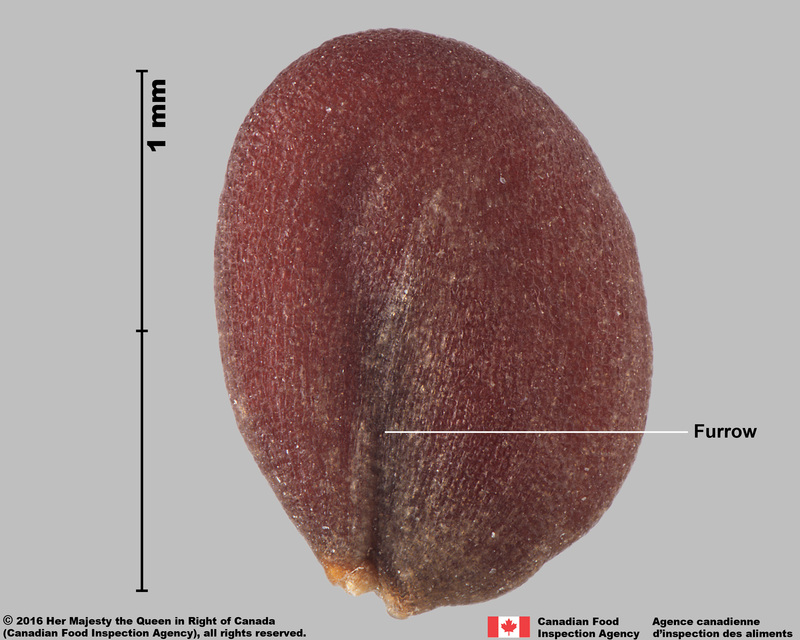 A fertilized mature ovule of a plant that is composed of: an embryo, nutritive tissue, and a seed coat. Thick, usually green bract of the flower that provides protection and supports the petals. 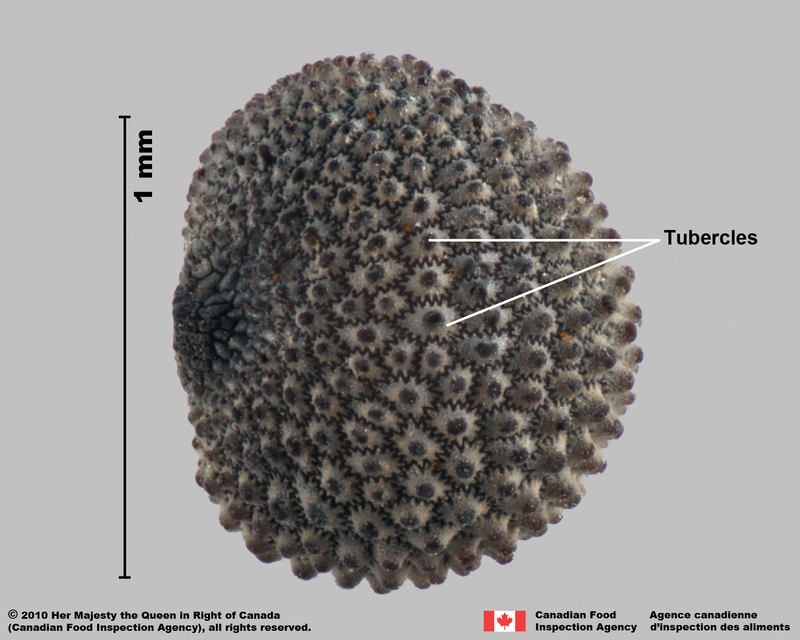 Reduced to scales in the Aster family (Asteraceae). Collectively termed the calyx. 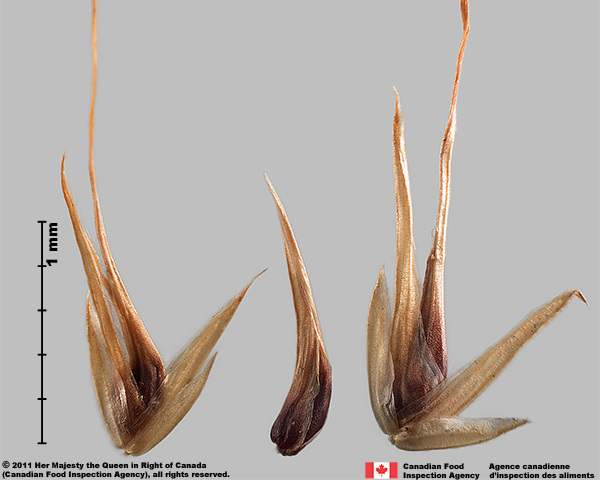 The inflorescence unit of the Grass family (Poaceae) composed of two basal glumes and one or more florets. 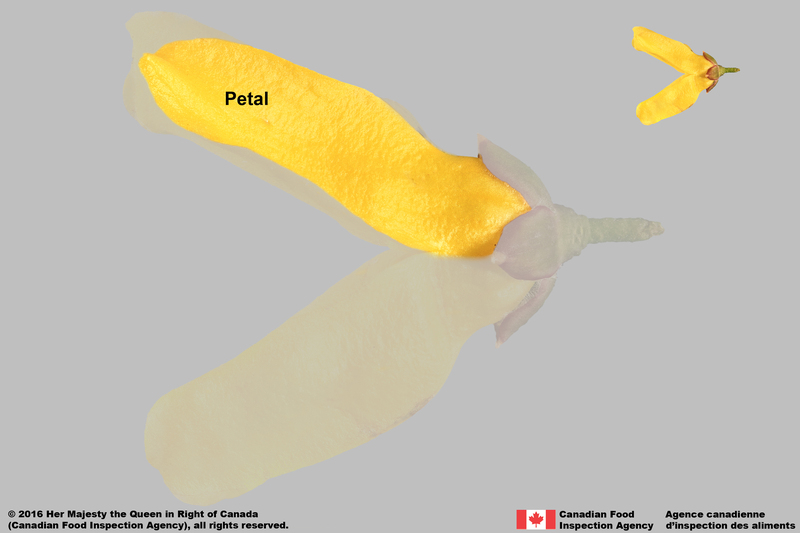 A reproductive organ in the flower that is composed of a stalk (filament) and an anther that produces pollen. 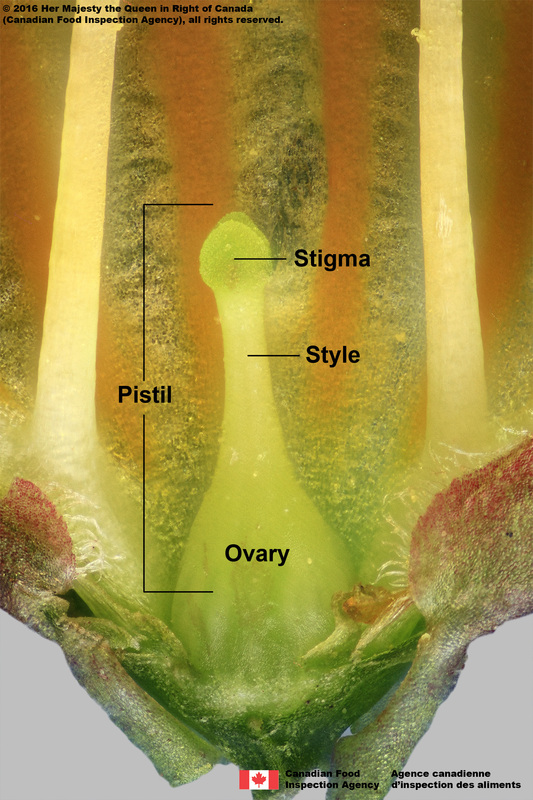 The stalk-like section connecting the ovary and the stigma of a pistil. 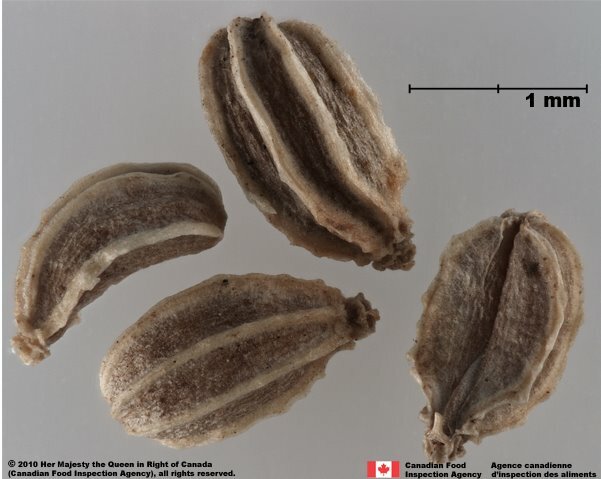 It often persists on the top of the fruit and used in identification, especially in the Buttercup (Ranunculaceae) and Aster (Asteraceae) families. 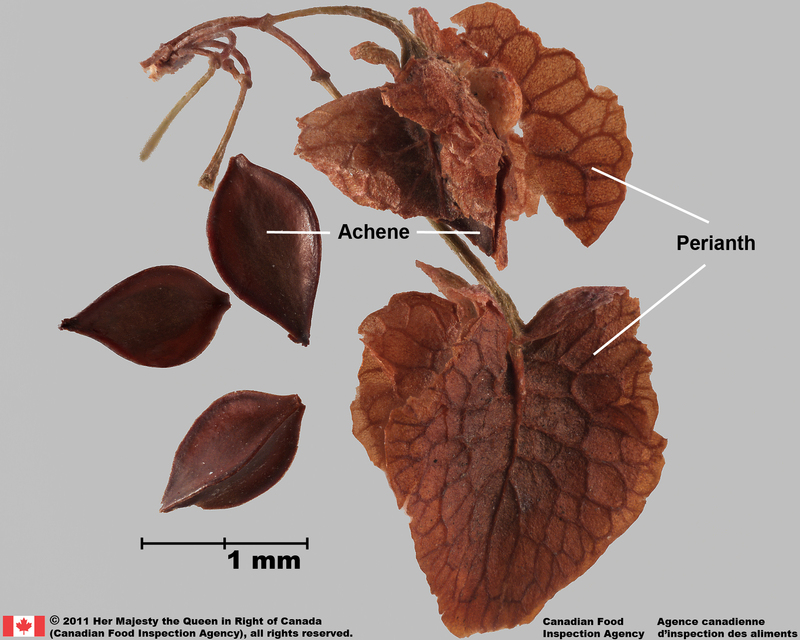 A bract in a perianth composed of petals and sepals that look alike and cannot be differentiated. Allowing light to pass through, but not transparent. A surface projection that is rounded and wart-like. 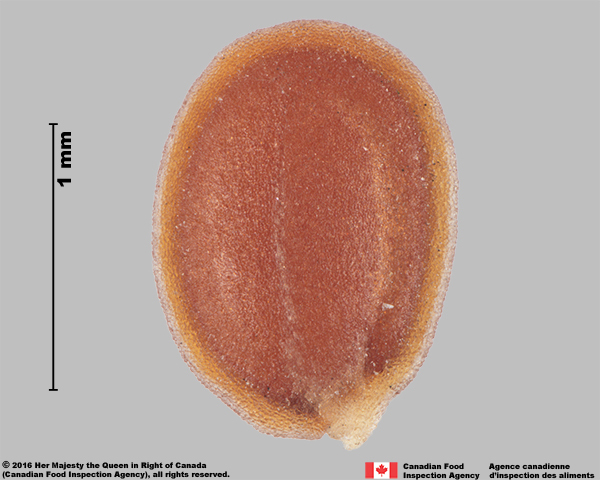 A small, dry fruit containing a seed surrounded by a thin fruit wall that is typically inflated. 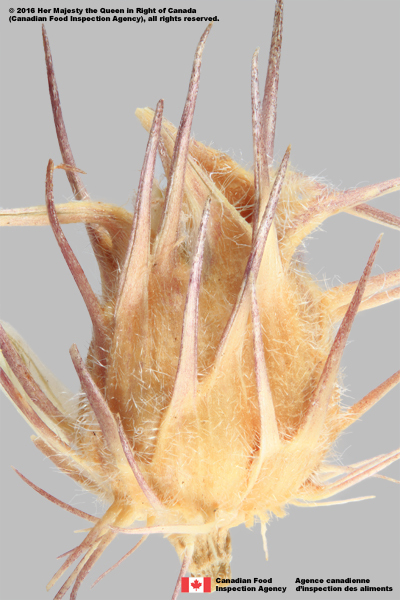 The arrangement of plant structures such as leaves and floral parts that encircle the stem at the attachment nodes. 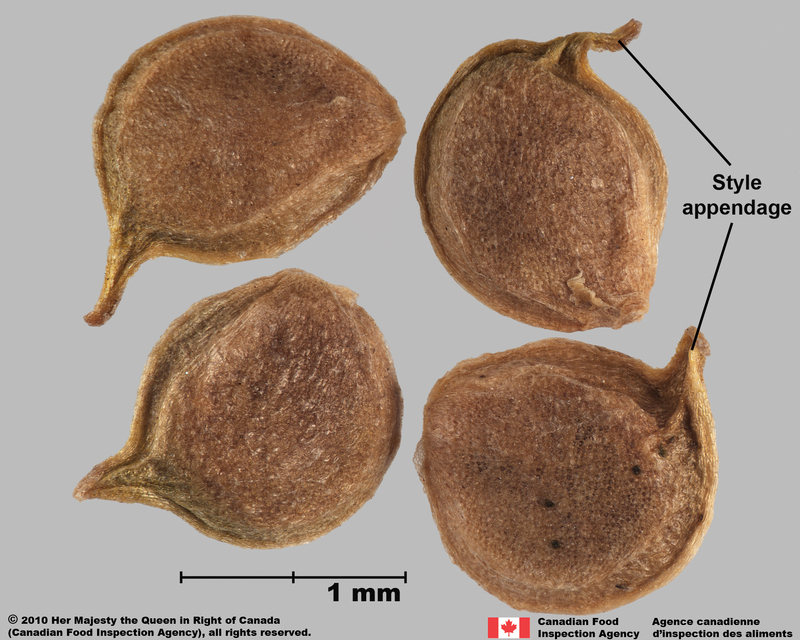 A plant that germinates in the fall or winter season and completes its life cycle in a year. It overwinters as a rosette which grows to produce flowers and fruits the next summer after which it dies.